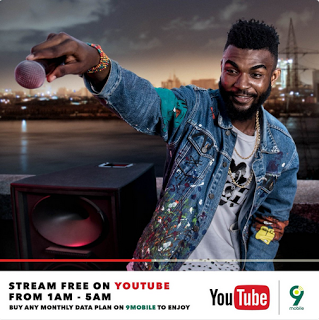 Still on the haunting for free surfing for my people , i saw this while strolling pass 9Mobile official twitter handle stated that Streaming Videos on YouTube is now free for 9mobile users , but there is a condition attached , and it quite fair. When you get any 9mobile data plan you get to enjoy free streaming from 1AM - 5AM , you know what that means , you get to watch videos unlimited during that hours . This would be a great news for the night surfers to enjoy with ease , what do you think about this ?